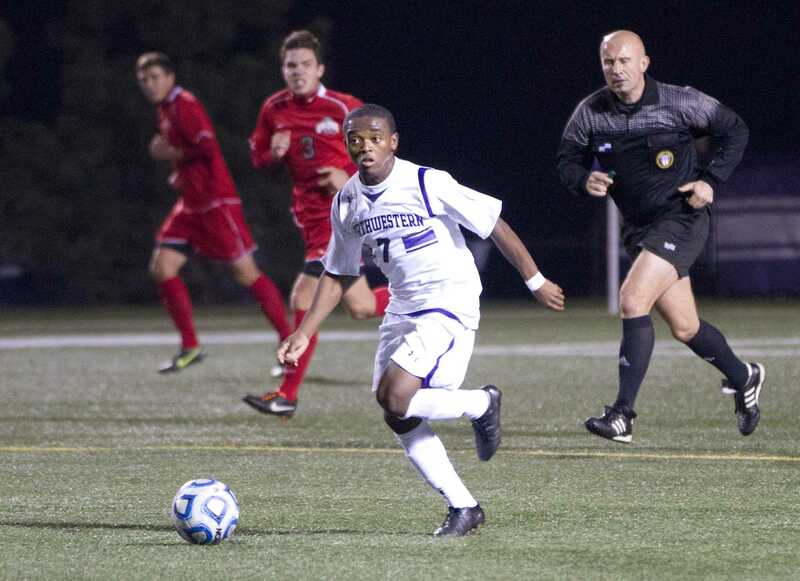 After receiving golden opportunity, Seetane scores in U.S.
Northwestern midfielder Lepe Seetane traveled a long path that has led him from Lesotho to the Wildcats’ starting lineup. One of the headlines of a strong recruiting class, Seetane’s time with the team has been as impressive as it was unlikely. When Lepe Seetane finally broke the news of his looming departure to his boarding school friends, nobody believed him. Seetane was trying to leave a place where opportunities are rare for 14-year olds. Dreams were often doused in a culture of doubt. But the doubters are left to gaze at the magic that the midfielder brings to Evanston. He has electrified the Northwestern faithful and a squad that won the regular season and Big Ten Tournament titles in 2011 and a tie of the regular season title in 2012. Though he remains focused on taking his team to new heights, Seetane never forgets his starting point. Lesotho is nearly impossible to find on a map. The Republic of South Africa engulfs the tiny, mountainous country with a population of 2.2 million. Crime — home invasions in particular — is extremely high. Life expectancy in Lesotho is now at 48 years, the second lowest in Sub-Saharan Africa. For every 20,000 people, there is one doctor. Just seven percent of households have electricity, while 12 percent have running water. As Seetane battled the odds at home, there was soccer, something that clicked with him at a young age. His father coached a local team and a young Seetane would tag along for games. Seetane’s soccer talents continued to grow with countless hours of practice. The fact is, he had no idea how incredible he was becoming. His high school and club coaches constantly told him he had a future in the sport, but soccer was not at the forefront of his mind. Soon, it would get him out of trouble and far, far away from home. In Louisville, Ky., Thabane Sutu, the goalkeepers’ coach of the United 1996 FC club soccer team, consulted with Marc Maguire, the owner of an auto dealership called The Car Store, about a dream of his. Through a connection, Sutu, who had played for the Lesotho national team, had heard there were some talented kids in Lesotho on the U17 national team who would love a chance to train and play on American soil. But they needed a place to stay. Maguire turned to his children to get their approval. The original plan was to have Seetane and teammate Sunny Jane stay for just a month before returning to Lesotho. It was supposed to be “an experiment,” as Seetane put it. It didn’t take long though for that experiment to evolve into a permanent change of address. Seetane and Jane traveled to the U.S., handled the players in their age group with ease and held their own against the older boys, too. Then came another life-changing crossroads for Seetane: Stay in America and work on earning a scholarship to a university or go back to Lesotho. He immediately called his mother and talked to her about his options. He was shocked at what she had to say. After hearing that, the decision seemed easier for Seetane. For their part, Maguire and his family were elated to show their new guests the American culture. Off the field, the two fresh faces at Trinity High School were turning heads and taking over the neighborhood. As time went by, there were moments when Seetane no longer seemed like a visitor. He was now part of the family. But as Seetane grew closer to his new family, he began to feel the separation from his relatives back in Lesotho. One winter morning in 2009, he was confused after being called to the principal’s office. When he saw Maguire there, he knew there was bad news: Seetane’s father, Khausi Constantine Seetane, had gotten tuberculosis and died. Seetane said he was incredibly happy to return home, although the circumstances were unhappy and very few things in his country felt familiar. An added change to the home was a gift Maguire brought, something that Seetane’s mother would cherish forever. Seetane spent only two weeks back home. When it was time to go, the decision to leave was not as tough as previous years. The fourteen-year-old teenager who boarded a flight out of Lesotho only a few years previous was not the same 16-year-old who got off the plane in 2009, and Seetane felt the importance of continuing his education after his father’s death. After Seetane’s return, letters from schools started flowing in for him and Jane, the two budding stars. They were offered close to 50 full rides, and Maguire and the boys found themselves traveling to all corners of the country. Suddenly Seetane, who admitted he once “had no idea there was such a thing as college soccer,” was fielding offers from some of the most competitive U.S. schools. Maguire had a hard time with the logistics of a visit to Northwestern, but a “bizarre windstorm” that knocked out the electricity and canceled school in Louisville for two days triggered a spontaneous trip to Evanston. Coach Tim Lenahan remembers the visit with Seetane and Jane, who he knew were some of the top players in the country for their class. He was aware of the interest these two players were receiving from coast to coast, and had difficulty gauging Seetane’s impression of NU during their first interactions. The top recruit wanted three things in his future school: education, soccer and proximity to Chicago. All signs favored the Wildcats, but Maguire’s financial situation presented the final hurdle between Seetane and NU. Maguire could not pay for both Seetane and Jane to go to college for four years, especially at an expensive institution like NU. But Lenahan was able to give Seetane the offer for which he was looking. With a full ride and a filled checklist, Seetane finally achieved his goal. He was going to be a Wildcat. Back in Louisville, life is more or less the same. Maguire, who has welcomed two more soccer players from Lesotho, could not imagine life without Seetane and Jane. Life hasn’t changed much for Seetane either. In Lenahan’s eyes, he’s the rock star of the squad. The 62-inch midfielder — 63 on a good day, he says — is Lesotho-sized as he stands under the glare of far grander American fields, making his presence known. The memories of Lesotho cling to his back like his jersey number, strengthening his stride in the land of opportunity.